For your convenience, we offer many ways to pay your utility bill, whether in person, through our secure night box or mail, or online. For an even quicker and easier way to pay, try online bill pay. Getting Started with Online Bill Pay Is Easy! All you need is your last name and account number to get started. 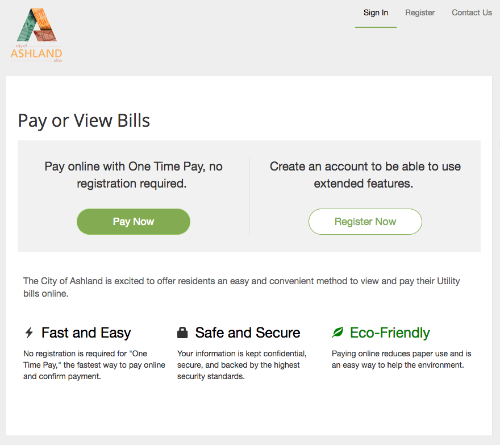 Enter your payment information, or sign up for autopay and never miss a utility bill again! We’re here to serve you. Call or email us to ask for assistance, or stop in. We can walk you through the process. Copyright © 2019 Division of Finance Utility Billing. All rights reserved.